Once your round of golf is over and it is time to kick back and relax, you won’t have far to go. Think 3-wood. You are only a short walk away from southern hospitality, delicious southern cuisine, vibrant entertainment and a bit of nightlife. Santee Restaurants: Regardless of your tastes, we’ve got you covered. From fine dining to fast food, here’s a listing of the restaurants in Santee. Offering fabulous Mexican food and home of the Massive Margarita. This restaurant features some of the area’s best steak and seafood. Homemade desserts include the popular orange pineapple cake. Located next to the Best Western, but in walking distance to several hotels. Open for dinner only at 5 p.m.
Buffet styled Chinese restaurant in Santee. Located in Rivers Plaza. For over 73 years, Clark’s has been serving Southern cuisine and spirits in a pub-like atmosphere with fireside dining. Open for breakfast, lunch, and dinner. New York style deli sandwiches, soups and salads. Located on Highway 6 East. Craig’s Deli does catering, also. Open daily 9-7. Located in the Clarion Inn at 123 Mall Drive. Happy Hour is 6pm – 7pm. $5.00 cover charge per person. Buffect available. Open nightly Thrusday through Sunday. Live entertainment. Ages 30 and older. Dress code is classic and classy. Located in the Clarion Inn at 123 Mall Drive. The restaurant is open Thursdays – Saturday, 5pm – 9pm. Full service restaurant in the Holiday Inn. Key Largo is a locally owned restaurant serving dinner only. Inside and outdoor dining with a varies menu. Small tiki hut atmosphere makes it a fun place to have a cocktail, listen to some music, and have a casual dinner . Open Wednesday through Saturday. 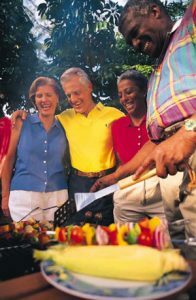 Family-owned, Bar B Que buffet. Open Thursday through Saturday for lunch and dinner; Sunday lunch is available until 3 p.m. Each night has a special meal. Catering or in-house parties available. Located on State Park Road, off of Highway 6 W.
BBQ lunch buffet and dinner. Good Southern BBQ with the “yellow sauce” is available 7 days a week. Located only minutes away from Santee National Golf course this bar and grill offers plenty to do with a games room that includes pool tables, a jukebox and a big screen TV. Pub-style atmosphere at the Quality Inn. Open every Sunday for “Southern Sunday Buffet.” Available for catering and private events or meetings Monday-Saturday. Locally owned. Large groups welcomed. No reservations necessary. Located on Bass Drive across from Santee Conference Center. Fine Thai and Chinese food. Family owned and operated. Menu choices include fresh Sushi made by Mr. Sam right in front of you. Small, intimate dining. Located near several hotels for easy walking. Reservations recommended. America’s place to eat. Open 24/7! Serves lunch, dinner and drinks and features live music. FAST FOOD CHOICES: BoJangles, Burger King, McDonald’s, Pizza Hut, Subway, Sub Station II, Taco Bell and Wendy’s. Come play in Santee with the Cost Cutter 2 Night + 3 Round Golf Package. and just $199 June 1-30! Contact Santee Cooper Resorts for more information or to book!